On Saturday, the Russian President's spokesman Dmitry Peskov said that Vladimir Putin and his US counterpart Donald Trump met for a "brief contact" on the sidelines of the G20 summit in Argentina. White House press secretary Sarah Huckabee Sanders, for her part, confirmed that Trump spoke to Putin on Friday night during a dinner with G20 leaders. Earlier this week, US President Donald Trump said that he had cancelled his planned full-fledged meeting with Russian President Vladimir Putin at the G20 summit in Buenos Aires on December 1 only because of the Kerch Strait naval incident. Last Sunday, three Ukrainian ships were detained after they deliberately entered Russian territorial waters which had been temporarily closed and began moving toward the Kerch Strait, which serves as an entrance into the Sea of Azov. Commenting on the matter, contributor Ivan Danilov noted in his article for Sputnik that although some will try to interpret the cancellation of the Putin-Trump meeting as a major diplomatic victory for Kiev, from a pragmatic point of view, the situation failed to significantly damage Russian interests. 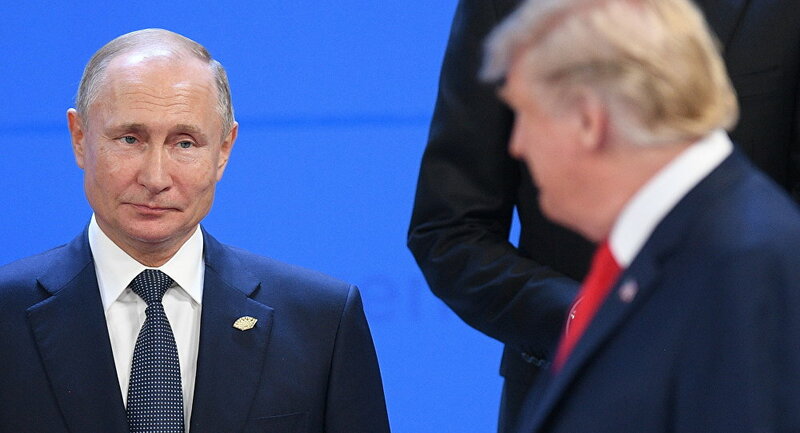 "Trump did cancel a full-blown meeting with Vladimir Putin at the G20 summit in Argentina, but it should be noted that those who see this as a kind of catastrophe or defeat of Russian foreign policy cannot really explain why they think so," Danilov noted. He recalled that Washington cancelling planned high-level meetings with Eastern European leaders is really "a horrible political omen that indicates the extreme irritation of the US administration." "However, such examples don't work when it comes to Russia and Russian-American relations," Danilov pointed out, rejecting mainstream media allegations that Vladimir Putin is greatly interested in meeting Western leaders to resolve the lifting of anti-Russian sanctions and Moscow's diplomatic isolation, among other things. These allegations are out of sync with the current geopolitical and economic reality, given that even Western sources "reluctantly admit that the sanctions policy against Moscow either does not work or leads to unforeseen positive consequences for the Russian economy", according to Danilov. He did not rule out that Trump will have to send his advisors to Moscow for high-level talks in order to compensate for his unwillingness to accept the media-related and domestic political consequences of the cancellation of his direct negotiations with Putin. "The decision to cancel the meeting is an indirect but clear sign that Trump just got afraid: he knows that he will be unable to press Putin like the leaders of other countries and that he will not be able to report another [political victory] to US voters. It would be wrong to simply cancel the meeting, because such cancellation would indeed be perceived as cowardice, so the 'Azov incident' created an excellent excuse to scrap the talks," Danilov pointed out. In this regard, he stressed, it would be more relevant to mention reputational and diplomatic losses of Ukrainian President Petro Poroshenko, who "received German Chancellor Angela Merkel's covert warning to calm down." Danilov referred to the German newspaper Die Welt, which cited Merkel as saying that she insists on "a peaceful settlement of differences between Kiev and Moscow" and that "the Ukrainian government should be clever enough to resolve the problem through negotiations because there can be no military solution to the issue". In conclusion, Danilov underscored that Russia is currently involved in the discussion of each and every major issue affecting world politics and "therefore, the cancellation of Trump's full-fledged talks with Putin is a loss for the United States, not for Russia." The views and opinions expressed by Ivan Danilov are those of the contributor and do not necessarily reflect those of Sputnik.